Last time we discussed optimizing your PCs performance, now we’re going to look at optimizing the performance of your Mac. While not prone to as many issues that slow things down, there are a few easy steps you can take to keep your Mac running it’s best. what is a mac tune-up? Over time your Mac performance will decline in a number of ways. Aside from more frequent run ins with the endlessly spinning infamous beach ball, it will take longer for your system to boot and to open and switch between programs. However by uninstalling unnecessary or unused programs, removing unnecessary login items, deleting unnecessary, unused, or forgotten about files, performing some basic disk maintenance, and by updating your system software, you can keep your Mac running smoothly. As with a PC it also helps to keep your computer and peripherals physically clean. We’ll do an article about that soon enough. Depending on how long you’ve owned your Mac, chances are you’ve installed a lot of different programs since you purchased it. And if you’re like most people then there are very few of them that you use regularly and a surprising amount of them that you’ve used once or never used at all. Uninstalling these programs is as easy as dragging them from your Applications folder to the Trash but doing so leaves behind orphaned files in your system folders. Thankfully you can completely remove them by downloading and running a free program called AppCleaner. After downloading and unzipping the archive, when you try to run AppCleaner you may get a message saying your security settings are stopping you from opening the program. 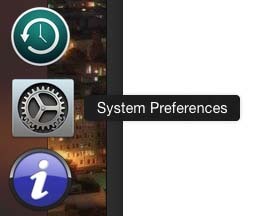 If so simply click on System Preferences in your dock. Once that opens click on Security & Privacy and then finally on Open Anyway. When AppCleaner opens you’ll be greeted with a small screen that has three tabs on the top and a big arrow on the bottom. To uninstall programs you don’t use anymore simply drag them onto the arrow and AppCleaner will make sure all of the leftover files will be removed with it. 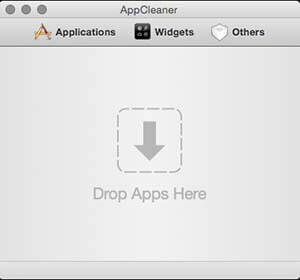 When you’re finished dragging programs into AppCleaner, simply click Delete and the program will take care of the rest. However make sure that you empty the Trash when it’s finished. Having too many programs loading when your Mac starts up can be a drain on system resources and affect your Macs performance. Some programs you install have processes or helper programs that need to run in the background just to function properly while other programs are set up to run at start up so you’ll have quicker access to them. And if you have shared drives on your network that you access regularly it’s really convenient to have them load at startup as well. Over time this can become a pretty crowded field. To view your current login items you will need to open the System Preferences, click on Users & Groups, and click on the Login Items tab. To remove something that you don’t need loading at start up simply click on the item and then click on the minus button beneath the list. 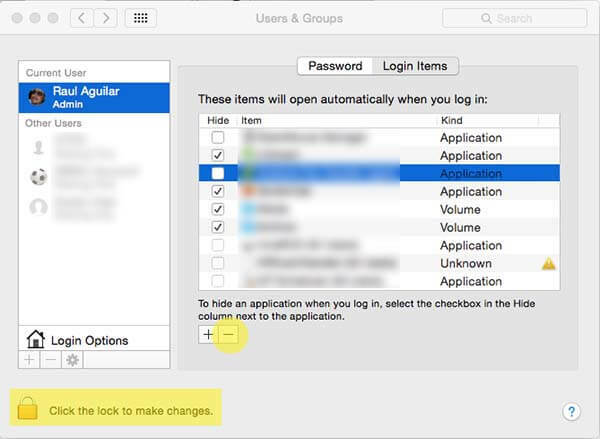 Before you can make changes you will need to click on the lock icon in the lower left corner. As always, if you see something listed and you don’t know what it is or what it does, make sure you Google it to see if it’s something that you can remove safely. 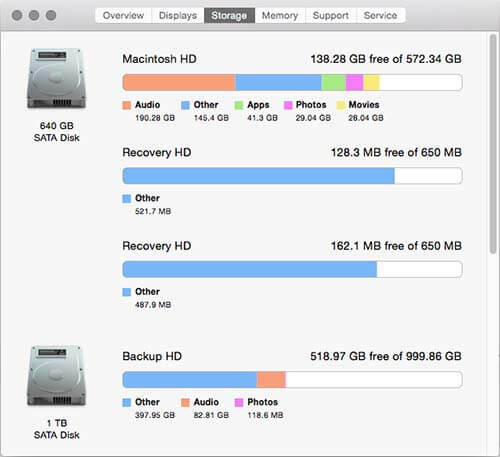 Probably one of the biggest factors in poor performance on a Mac is a nearly full hard drive. If the drive doesn’t have enough free space your Mac will take longer to boot, it will run slower, programs will load and run slower, accessing files will be slower, and you’ll get that stinkin’ beach ball much more often. You can find out just how much free space you have by clicking on the Apple icon in the upper left corner of your screen, clicking on About this Mac, and then clicking on the Storage tab or on More Info and then Storage. Thankfully there is a terrific free program called Disk Inventory X that can help you find and remove unnecessary, unused, and unwanted files from your drive. 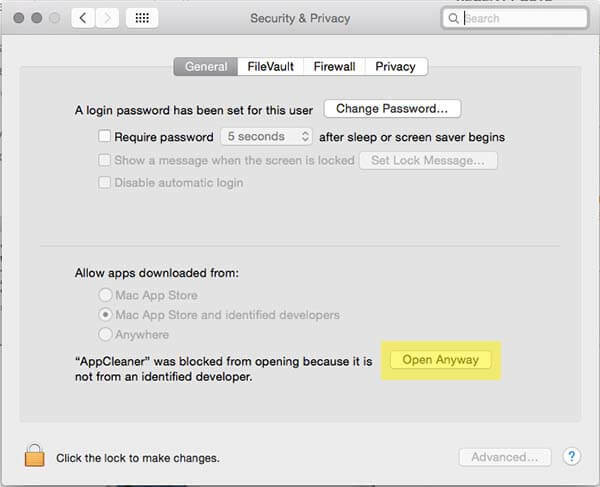 You will need to go back into System Preferences to allow this program to run if you get that security error again. When you run the program you will be greeted by a screen that shows you all of the drives in your system. Click on the Macintosh HD drive and click Open Volume. After it analyzes your drive a new window will open that shows a colorful map of the data alongside a color coded list that shows you the different kinds of files on your drive. Now I’ll be honest, this is not the most user friendly interface. It’s downright ugly. 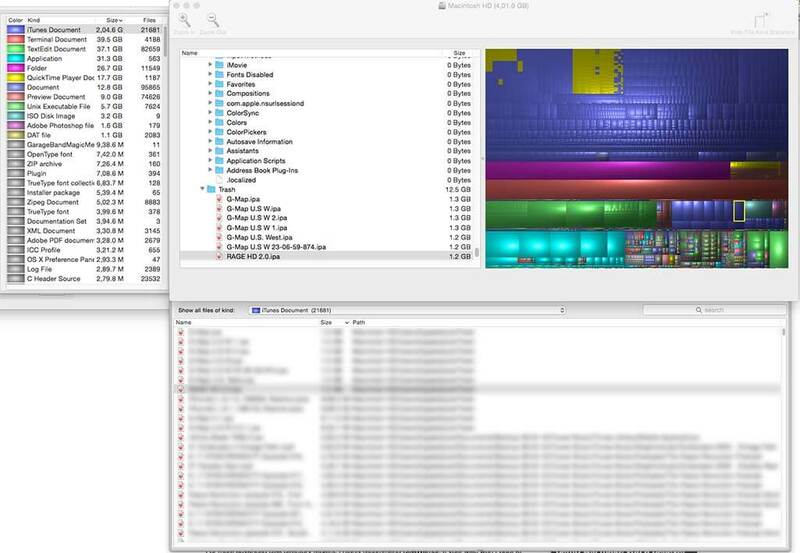 But where the program shines is in the color coded list on the left side of the window. It lists all of the data from largest to smallest so you can look into each category in more detail. For instance, if you right click on the iTunes Document section you can click Show Files in Selection List and a window will open on the bottom that shows all of your iPhone app files, downloaded podcasts, music, and movie files. If you’ve moved from an iPhone to an Android phone for instance, you can delete all of the iPhone apps to reclaim drive space. And you can also remove any podcasts that you’ve already listened to, unless you want to save particular episodes. Simply right click on the file and click Move to Trash. Now if this is too daunting and you don’t mind spending $10 bucks, there is another program that is far more user friendly called DaisyDisk. You can find a very nice review of the program at Cult of Mac. That being said, while you won’t find everything that can go, the easiest free way to clean up the disk clutter is to go through your Downloads and Documents folders and delete old screenshots, images, documents, installers ending in .dmg or .pkg, .zip files, videos, music, and anything else that you no longer use or need. If you have an external hard drive you can copy all of your movies, music, pictures, and documents to that drive and then you can delete the originals from your Mac if you need to. Another possible factor in poorly performing Macs is file system corruption. System crashes, sudden shutdowns due to power outages, or hard restarts can all cause file system corruption. Thankfully your Mac has a built in tool called Disk Utility for checking your disks file system. It’s a good idea to use this tool after each of the events I described above, however it’s also a good idea to use it every few months to check for any small issues before they become more serious. 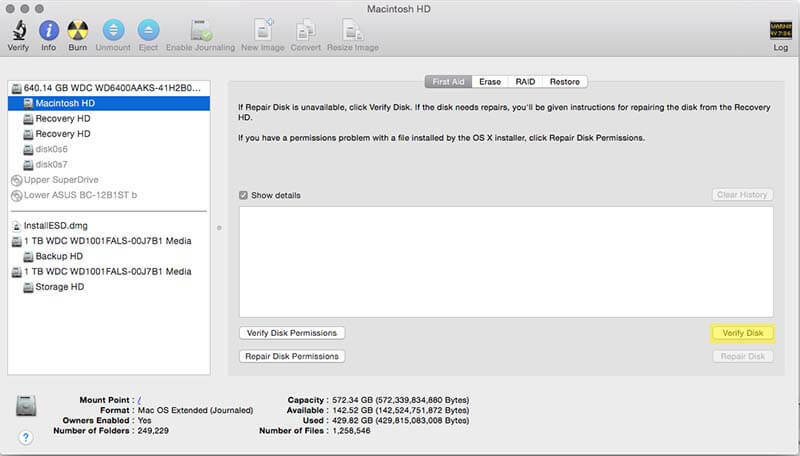 To check your file system navigate to your Applications folder, then into the Utilities folder, and finally click on Disk Utility. When the window opens click on Macintosh HD and then click Verify Disk. After a few minutes it will complete and show you any problems it’s found. If it does find something it will also give you directions for how to repair it. Most of us keep our browsers open all the time, often with a dozen or more tabs open at any given time. And those of us with two or more monitors connected to our system often have one or more browser windows open in each monitor! That can add up to a lot of open tabs. However even if you’re only using one browser window with a few tabs open, if you leave it open constantly your browser will start to eat up your available memory and CPU cycles. Whether this is due to memory leaks in the browser or leaks from any installed browser extensions it’s not unusual for your web browser to consume a hefty chunk of both memory and CPU. 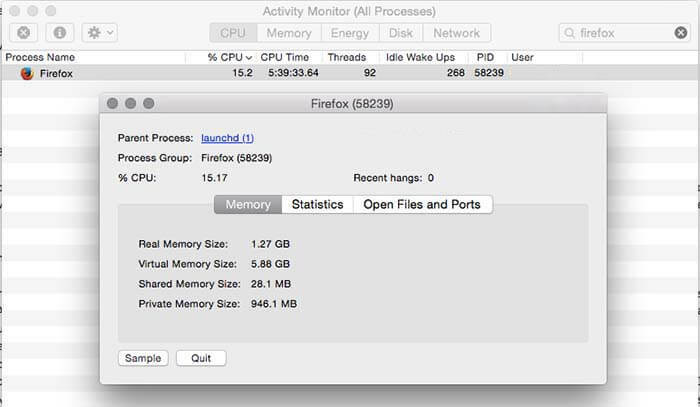 I’ve had Firefox open for at least 12 hours and it’s using 15% of my CPU with frequent spikes to 40% or higher in addition to the memory usage. These numbers are far worse after having the browsers open for a few days. So to minimize performance drains in both the browser and in the operating system, simply make sure you bookmark your open tabs and exit your browser at the end of each day. Everything running on your system uses up memory and CPU resources including a few things you seldom think about. Many people have tremendous numbers of folders, documents, and pictures on their desktop and each one of these is essentially a little program using up resources. All of the widgets running in the Dashboard are programs as well. And programs running in the background because they weren’t exited are sapping your systems resources too. 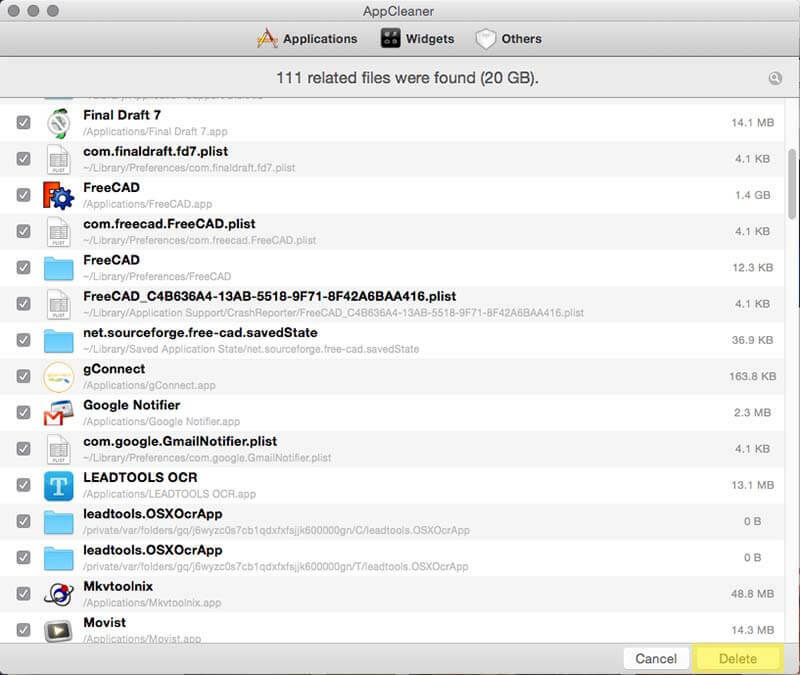 All of those things accumulate and contribute to slowing down your Mac. If you have lots of icons on your desktop you can either create a folder on your desktop and throw everything in that or you can spend 15 minutes or so and move the files around. That is you can move all of the pictures to your Pictures folder, all of the documents to your Documents folder, and so on. To reduce or eliminate your open widgets click on the Dashboard icon in the dock or in your Applications folder, then click the minus sign in the lower left corner of the screen, and finally click the X in the upper left corner of each widget you can live without. Unless you use a widget regularly and have no other alternative to that widget I would recommend just closing all of them. Finally in order to reduce the number of programs running in the background make sure that you are exiting the program and not just closing the programs window. 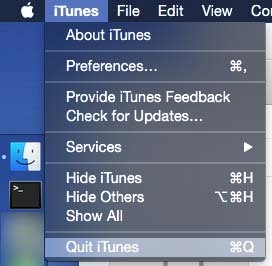 For instance when you finish using iTunes move your mouse to the upper left corner of the screen and click on iTunes and then Quit iTunes. This will shut down the application entirely so that it stops using system resources. Just like with Windows, Apple regularly releases system updates and security patches. To make sure that your system is running at its best you will want to install new updates as they are released. To do so simply click on the Apple icon in the upper left corner of your screen and click on the App Store. When the App Store opens click on the Updates tab and click Update All. You will often have to reboot your Mac to install these updates so make sure to save whatever you’re working on so you don’t lose anything. Now that you’ve cleaned all the clutter, run some preventative maintenance, and gotten your Mac back into shape now is a great time to make a backup of your operating system and personal files. Whether you backup to local external hard drives using Apple’s Time Machine or the popular CrashPlan, or you backup to a paid online service like CrashPlan’s cloud storage or the equally popular Carbonite, backing up your system and personal files is critical. Most people don’t think about backing up their data until it’s too late and they’ve lost everything in a hard drive crash or something similar. Don’t be that person. It’s not good times. 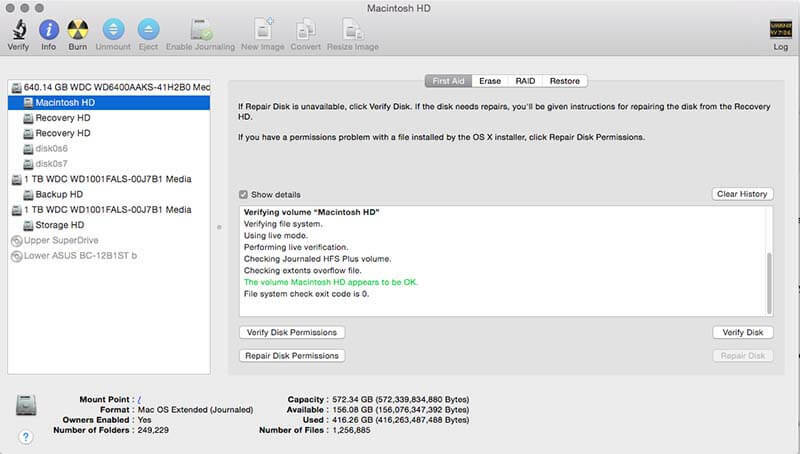 There are a number of other suggestions people will give you to optimize your Macs performance like repairing disk permissions and clearing system caches, but most of them are unlikely to provide you with any performance gains and are really more troubleshooting actions than maintenance tools. All you really need is to follow the tips outlined above on a somewhat regular basis and your Mac will be running nicely. Of course I can’t end an article on improving the performance of your Mac without mentioning the one solution that will give you the biggest performance increase and is, unfortunately, not free. And that is to install more memory. Macs love memory and if you fill your memory slots with as much as you can afford, your system will run significantly better.